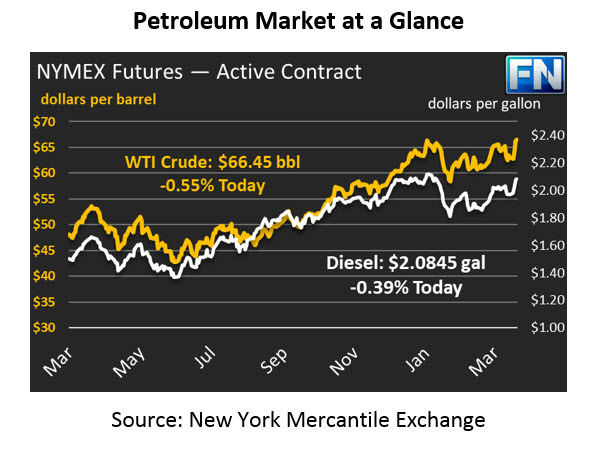 Markets hit a three-year high yesterday, with crude oil prices closing the day at $66.82. It’s been a little while since we said that. The last time prices were this high was December 3, 2014. Diesel prices are up almost 15 cents in just three days. And we haven’t even hit summer driving season yet. We recently did a webinar sharing some key reasons why oil prices could continue to push higher – fundamentals, financials, and politics. If you missed it, check out yesterday’s FUELSNews email for a link. If you’ve already exceeded your fuel budget, it may be time to layer in some protection before prices rise even higher. Choosing not to reduce risk is choosing to let volatile market events dictate your company’s profits. If you want to discuss avoiding going further over-budget, contact risk management expert Jay Blanton at jblanton@mansfieldoil.com. Oil prices are trending lower this morning after yesterday’s record close. After gaining $4.80 over just three days, markets are pulling back slightly, as some traders cash in their gains and exit. Most are simply hesitating, waiting for the numerous bullish rumors to turn concrete. Crude oil is down 37 cents, trading at $66.45. Fuel prices are also tracking slightly lower this morning. After gaining nearly 7 cents on Tuesday and another 3 cents yesterday, diesel prices are trading slightly lower, losing 0.8 cents to trade at $2.0845. Gasoline has seen slightly larger losses, giving up 1.9 cents and trading at $2.0489. Trump is backing away from his announcement of strikes on Syria after yesterday tweeting that “missiles are coming.” Mike Pompeo, nominated to be Secretary of State, has said that if appointed he would look for a solution to the Iran deal. The two updates have given the markets pause, for now, in sending prices soaring higher. Of course, the fundamentals still appear supportive for higher prices over the longer-term, especially if Iran deal talks break down and lead to the imposition of sanctions on May 12. While markets rose quickly yesterday in response to political news, the near-term fundamentals were a bit less riveting for crude markets. Crude inventories gained 3.3 million barrels, far above the expected slight draw. On the other hand, diesel inventories resumed their downward decline. After seven straight weeks of inventory draws, diesel stocks saw small gains last week, only to drop even lower this week. The pull of diesel stocks, due both to strong demand and strong exports, has helped keep diesel prices elevated despite the market pullback this morning.